MAGNOLIA – David Dodson grew up in Magnolia on the campus of Southern Arkansas University, a place where he was first exposed photography and his talents were developed. Years later, he has two photographs on display at the SAU Brinson Art Gallery with the Arkansas Arts Council’s traveling Small Works on Paper exhibition through November 23, 2015. Dodson’s photographs in the exhibit were taken in the Little Rock area, where he and his wife, Sarah (Farrar), now live. 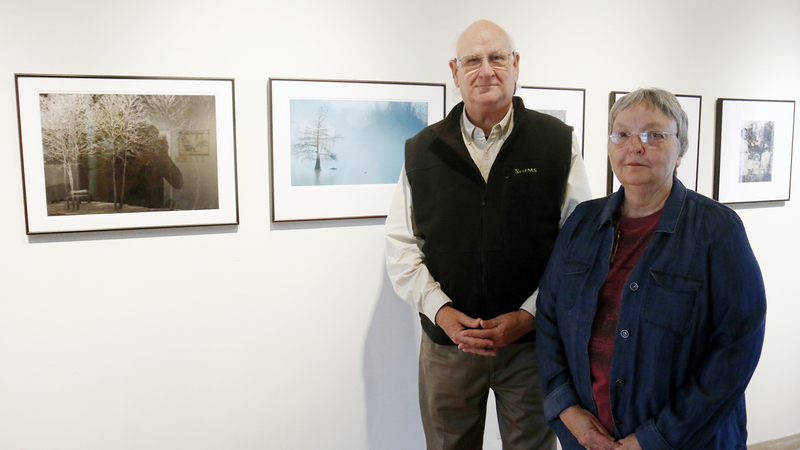 The couple recently visited the exhibit with local family members to view Dodson’s pieces. “Lake Sunset” is a black and white image of trees, and is available for purchase at $225. “Blue Mist” is a serene monochromatic image, and has already been sold. Dodson is retired from Arkansas Farm Bureau, and he has recently enjoyed taking back up his passion of photography. His specialty is nature photography, especially trees. “Wildlife is too unpredictable,” he said jokingly. He has toted a camera around his neck since the age of 12, when his parents got him a camera before a family trip to Florida. Dodson’s father was manager of the dining hall at SAU, and the family resided on campus. He remembers many a summer day swimming in a water fountain on campus. Dodson naturally attended the university that was his home, and earned his degree from SAU in 1972. His college experience included taking photos for the student newspaper, “The Bray.” Better yet, he and his wife first met in a geology class. “We’ve been rock hounds ever since,” said Sarah. 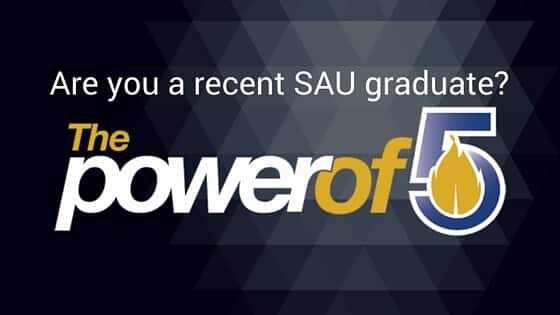 The Dodson’s have remained connected to SAU, and have even established a scholarship in honor of Sarah’s mother and family, Quelle, Lovie and Opal Hayes. Dodson has received numerous accolades for his photography, including being named Photographer of the Year by the Arkansas State Collegiate Press Association. Also, in a national American Farm Bureau Federation competition, Dodson earned the Best Photo Essay award. Three previous years, 2006, 2009 and 2011, he was also selected by the Arkansas Arts Council for the Small Works on Paper exhibits.